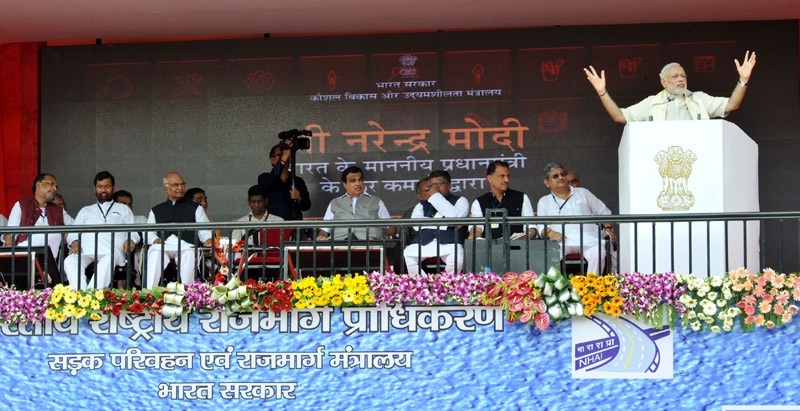 Arrah (Bihar): On a scheduled visit to Arrah to inaugurate road projects in Bihar, Prime Minister Narendra Modi today announced a development package for the State amounting to a whopping sum of 1.25 lakh crore. This came in just just as Bihar readies itself to go to polls. Modi has made NDA’a intentions very clear by announcing this bonanza for Bihar and by trying to promote NDA’s development agenda for upcoming elections. As an attempt to counter the opposition buildup in Bihar’s electoral ambiance, Modi has played a master-stroke that would also take away the wind from the sail of Chief Minister Nitish Kumar and caste-based politics as well as other caste-ridden political strongholds. Not missing out the opportunity visi-a-vis the upcoming elections, Modi made a blistering attack on the Bihar Chief Minister and underscored the pitiable state of affairs in Bihar. Modi took the UPA head on by lashing out against the previous Central government for having provided a small Rs. 12,000 crore package for this development-starved state.